The illustrious town of Guadalupe was a typical Spanish mountain village in days gone by. Located in the southern region of Extremadura, it is situated at the foothills of the Sierra de Altamira. One of the town’s most significant attractions is the Sanctuary-Monastery of Our Lady of Guadalupe, now declared a World Heritage Site. It was King Alfonso XI who commissioned the construction of the Monastery, in gratitude to the people of Guadalupe for their contribution during the Battle of Salado in 1340, and once the Monastery was completed, it became one of the main pilgrimage centres in the Peninsula. However, there was also another reason why people flocked to Guadalupe. In 1325 a local farmer stumbled across a statue of the Virgin Mary half buried in his field. It was believed that St Luke himself had carved it. With Queen Isabella’s endorsement, word soon spread of its existence and in its honour a shrine was eventually built. You will find the shrine in the Camarin Chapel. Rather ironically though, the chapel itself has become almost as famous as the statue with the decorative railings that surround the grounds. Inside there is also a Mudejar cloister, a 14th century fountain built by the Moors and a collection of paintings by the 17th century artist Zurbaran. There are several museums to explore in town, but one of particular note is the San Jeronimo Chapel with a fascinating exhibit of fabrics and miniatures. As you walk through the streets of Guadalupe seek out the Calle Mayor, lined with charming traditional homes decorated with interesting wooden balconies and porches. This was once the main street centuries ago and has a network of narrow streets leading off it. 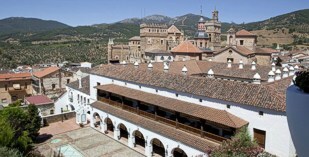 Not far from the Monastery is the old hospital of San Juan Bautista built in the 15th century. Throughout its history, the hospital was an important School of Medicine where many doctors of the Royal Court trained. The annex was used as the Colegio de Infantes, and students of the College studied grammar, singing and theology. Today this historic building is now the Parador Guadalupe(Hotel Zurbaran), a charming four-star hotel. Providing a comfortable and relaxing atmosphere, it has a very attractive courtyard decorated with citrus trees, a secluded swimming pool, and tennis court. Like most Spanish towns, the people of Guadalupe love to celebrate with festivals. In February they hold the Romería de San Blas (Pilgrimage of San Blas) with a flowery garland parade, a religious procession, and a huge picnic of regional food. Easter is one of Spain’s most famous festivals, the Semana Santa, followed by the Fiesta de la Cruz in May. However, the most dramatic event would have to be the one in August, the Toros Tradicionales. This particular festival always causes great excitement, as young bulls race through the streets on their way towards the bullfighting arena. If you decide to come later in the year, the Fiesta de la Hispanidad, otherwise known as Columbus Day, takes place in October. Surrounded by gorgeous countryside, it would be very easy to fill your afternoons with a scenic drives stopping off at one of the many interesting towns in the area such as Canamero and Berzocana. Bohonal de Ibor would not only make a lovely place to stop for lunch, but it is also where you will find the 2nd century Columnata de los Marmoles. For those who enjoy outdoor pursuits, the Monfrague National Park is a must. There are hiking and mountain bike trails, or you can even go horseback riding, all of which will take you through some of the most stunning scenery. What better way to round off your stay in Guadalupe.